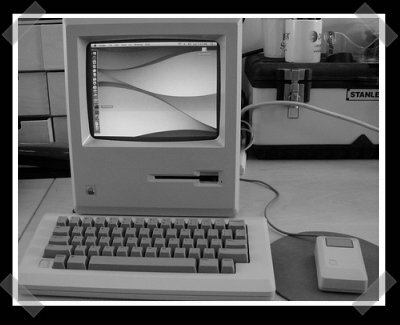 [Dave] sent in his retro Mac project. Putting new guts into an old mac isn’t really unheard of, but I liked his solution to use the original Mac 512k keyboard and mouse. He used an Atmel AT90USB162 to create his own standard USB HID device. The keyboard and mouse appear as a standard USB device, so the mac (or any modern USB PC) can identify use the keyboard and mouse without any additional software. I remember that overheating the 512k was a huge problem back in the day. There was a smokestack like device you could buy to help improve heat dissipation. I cobbled together a 120V fan to the top of mine. Unfortunately there is no mentioning of how he hooked the macmini up to the original B&W CRT monitor. Any ideas?.. K.
He didn’t hook up the original monitor. He did the same thing that I did when I hacked an SE/30 which was to find a normal monitor that could be retro-fitted inside the Mac case. The old Mac monitors are very limited in terms of their capabilities and it would be very hard to make them work with a modern RGB or composite input. i once saw a great use for an old mac. it envolved taking everything out and only using the needed items……. like fish. or a lizard. Thanks smackjack and alphabeta!.. Now I see. case by adding some fans since there is about two to three times as much power being dissipated by the new guts. If a core duo mac mini is being used then I’m surprised it hasn’t been crashing as these tend to run a little hot even when not stuffed into another case. I suggest adding a few small fans on the top vents in side the case and some ventilation slots on the bottom of the case. Also on the keyboard and mouse hack that’s very nice esp by not requiring any drivers and it still hooks up like stock. It now has a better keyboard then carpel tunnel inducing one that comes with the new imacs. Hey, if someone would like to attempt this hack, or make a fish tank or whatever, I have a couple of classics and a classic plus. I’ll sell them to you for cheap, make me an offer. I also have a commodore 64 with all the peripherals, games and books. spencer richard haley at gmail dot com.